While I did indeed go to Seattle for Christmas vacation (about 24 hours of it), it’s more true that I spent the holidays in the boonies of Washington state. With the new-ish boyfriend. For our first family vacation (and, as I said in a previous post, maybe our last—because those people are crazy). Not to say they are more crazy than MY family. But I wouldn’t be begging to go on vacation with those folks either. We had a pretty great time, I’d say. 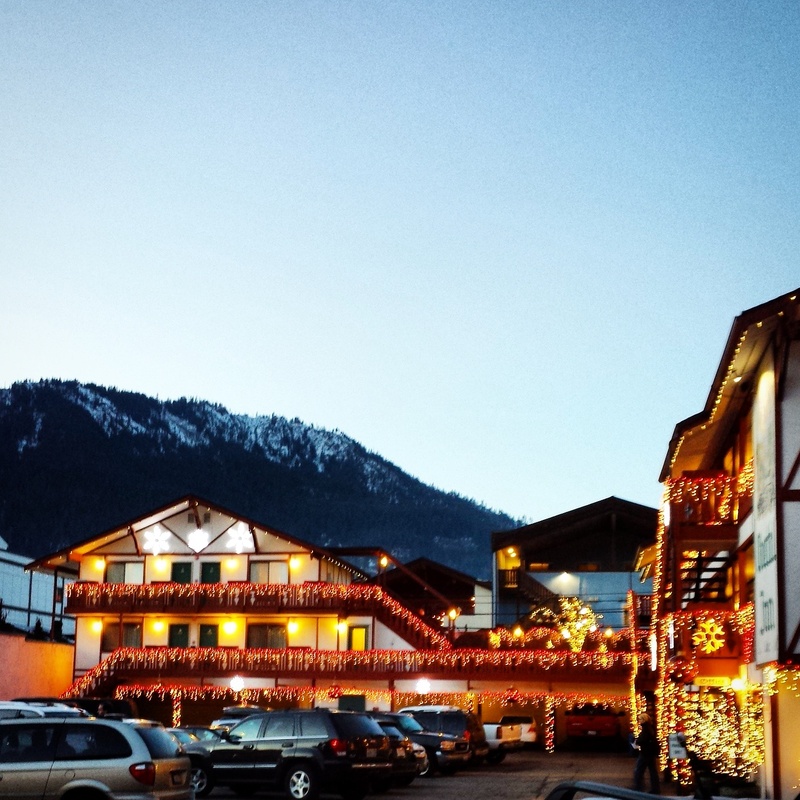 I’m still daydreaming about this one place in particular: Leavenworth – a town entirely modeled on a Bavarian village. 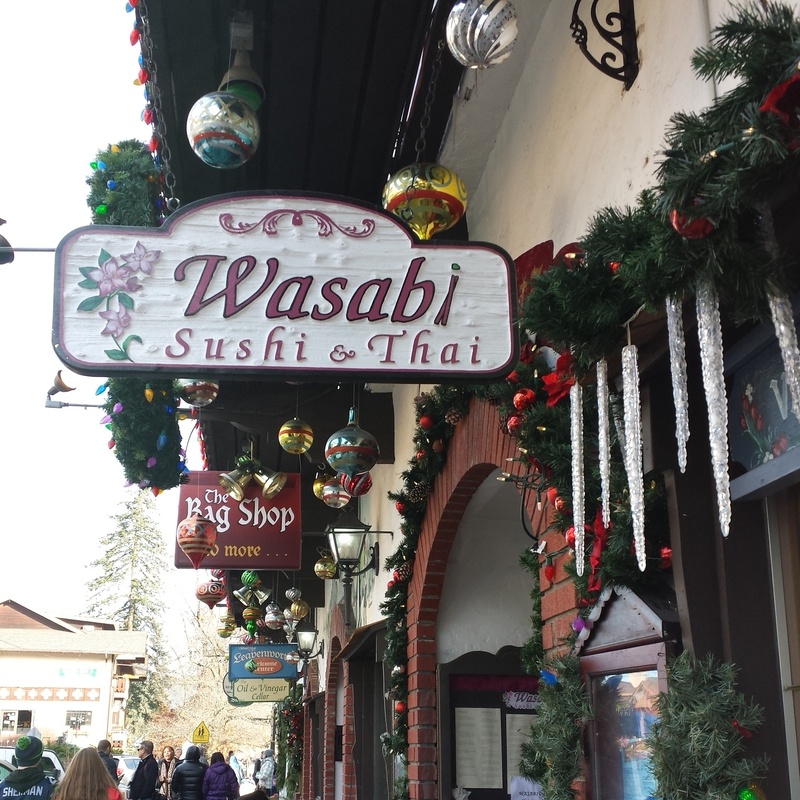 The day after Christmas, we drove about an hour from North Bend to check out this quaint town. The last thing I was expecting to see when we jumped out of the car to walk into the town? 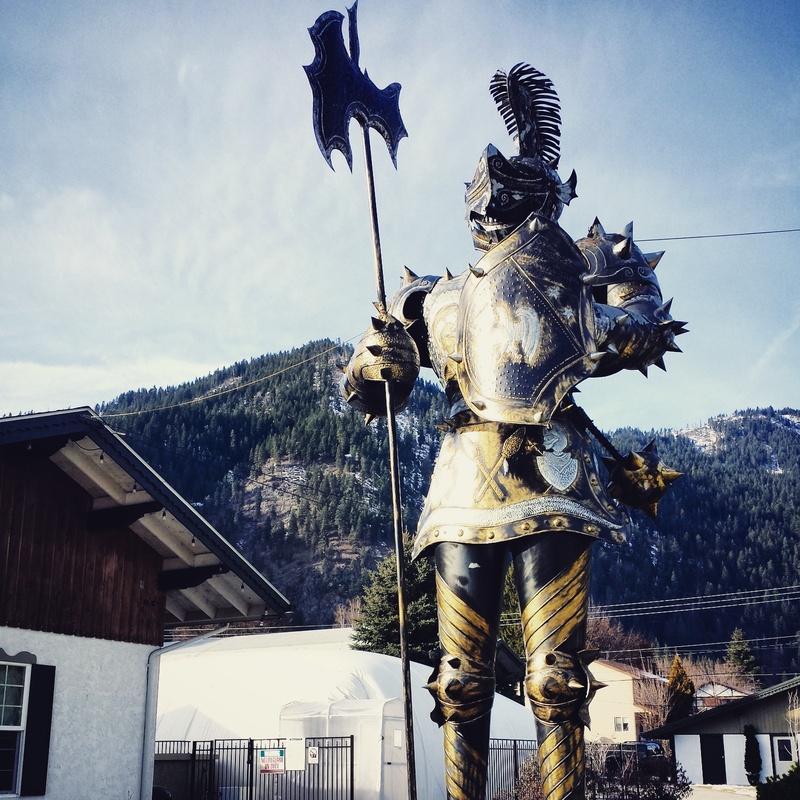 A two-story tall spiked knight in full armor. Correct me if I should have expected this. Sleeping on the job? Who knows? 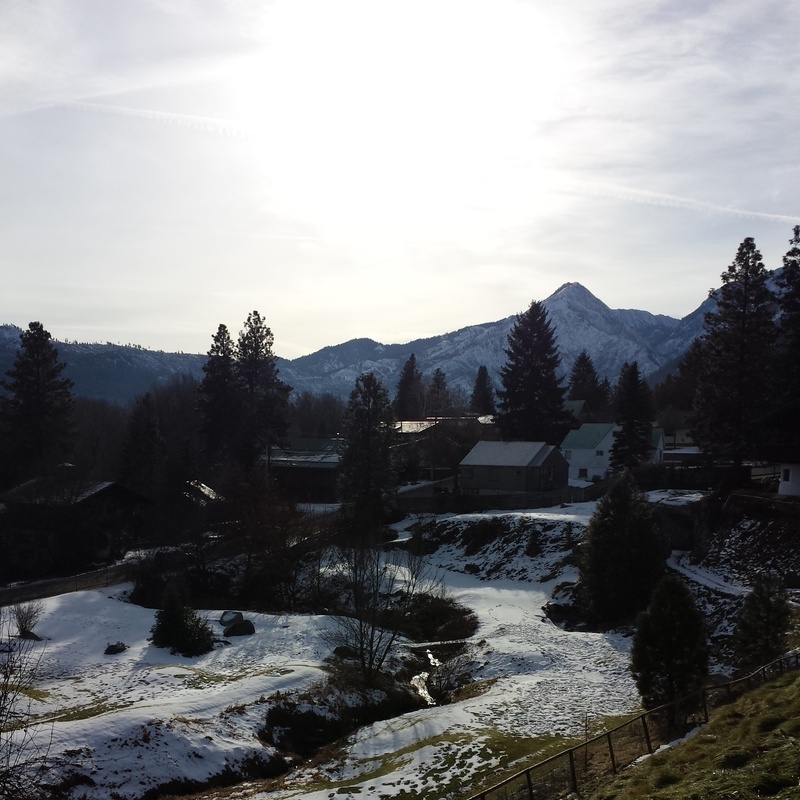 It felt like we were being cradled in this nature-made saucer of little Germany, gently framed by frosted mountains. Don’t let the peek of green grass fool you—it was multiple-layers-of-pants freezing. Surprise #2: The architecture! This is a quaint town through and through. Population: approx. 2,000. A picture of me, for fun, and the town’s tallest buildings. Did I mention it was freezing? Surprise #3: Asian cuisine. This is the furthest variance from old English style font we saw all day. And boy, was it tasty… Just kidding. 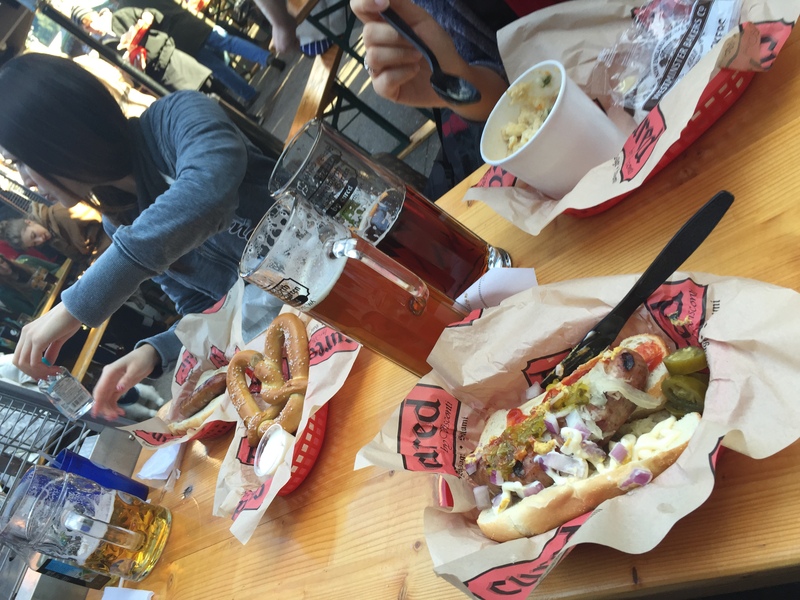 Who eats here when there’s a sausage and beer garden (and wine tasting) on every block? Note those cute holiday decorations, though. The architecture was like comfort food for my soul, and it seemed like the sky was doing everything it could to be the perfect backdrop for every shot. Replace the concrete with cobblestone and nix the truck (and telephone pole) and we are in the land of my dreams. Seriously, though—it was frckn cold. We ducked into the nearest anywhere to get warm and find a restroom. We found this cute underground, stone-walled den and got ourselves two hot red wines (delish!) 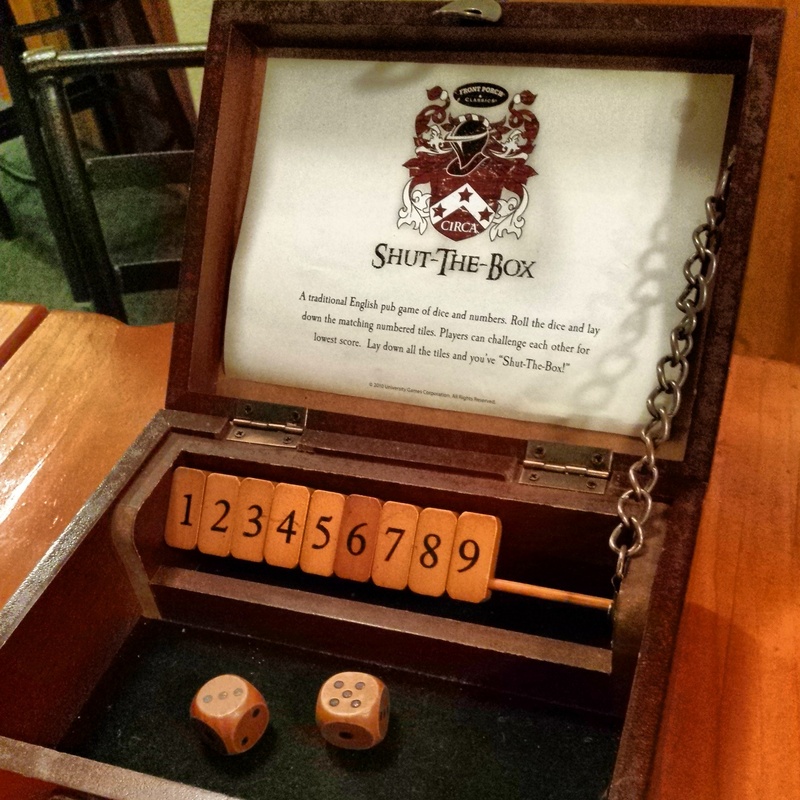 and attempted to play this incomprehensible dice game. Still convinced this game is just the ultimate troll on drunk patrons innocently seeking shelter. After we warmed up a bit, we went outside to meet the family and split up with them again on a double date. That’s about the time we decided to grab some beer, have a little meal and eat some edibles… then lost all desire to take pictures for several hours. 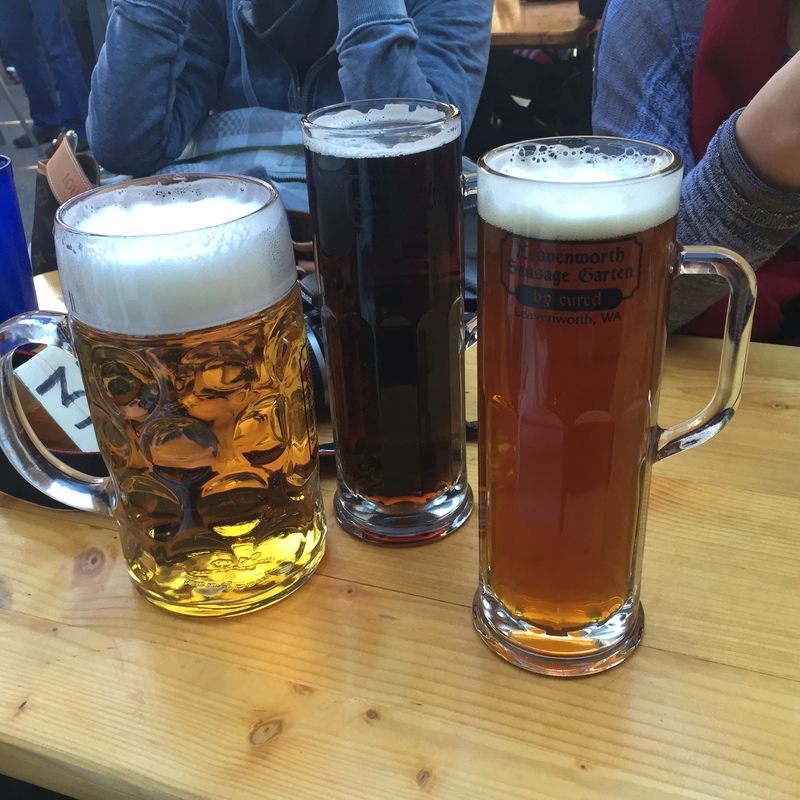 Mm… das bier ist zehr güt! Eventually, lover boy and I were on our own again after a large beer, a few rounds of wine and a fun trek through the snow and into a clearing by a lake. It was nearing twilight and everything was beyond picturesque. The moon balances every so lightly. 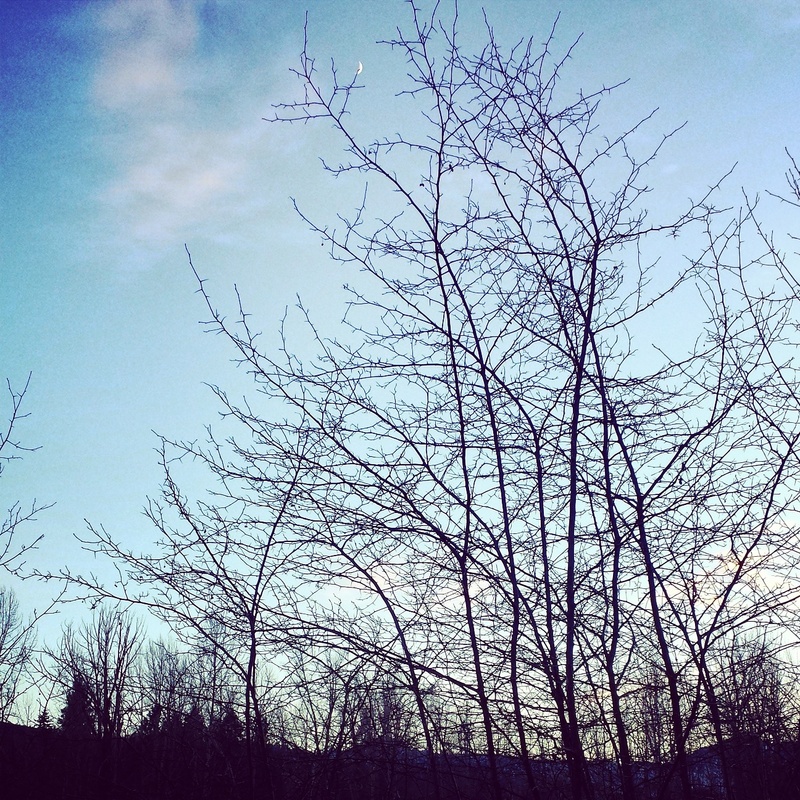 We took pictures from behind the brush to capture the silhouettes on the perfect winter sky. But when we stepped out into the clearing, where the packed ground slid into the shallow water of the lake, what we saw was unbelievable. And not another soul in sight. 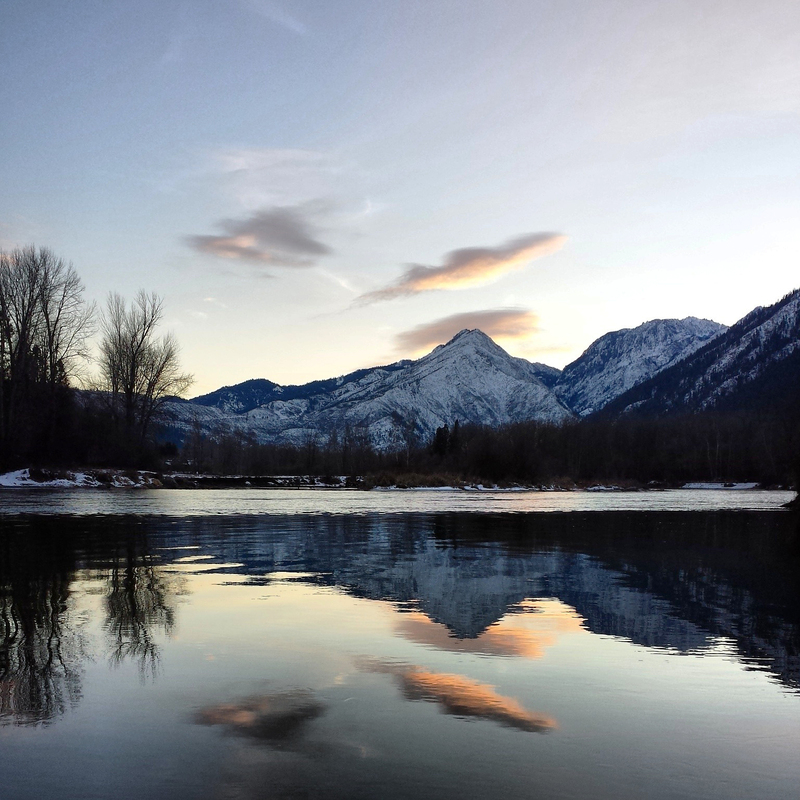 I’m only sorry that I took this picture with my Galaxy S4, but the resolution in my memory is as definite as the bliss I felt at that moment. Transported into the cover of a nature magazine, in front of mountains that were not even on my bucket list to see, behind a glassy lake that is still nameless to me. And it was just us, watching the hovering clouds slip slowly behind the peaks like feathers falling in slow motion. A family trickled in after an indiscernible amount of time and we walked away to give them their own blissful alone time with this incredible sight. Night was slowly descending and we headed back into the town. Every angle was something new. I almost didn’t believe it was the same path we had taken to the lake. The empty Christmas decorations had absorbed the light from the day while we were out and the buildings shone, giving everything crisp, new vibrance. That’s when the family called to rein us back to the car. The only problem is we weren’t ready to leave. How could we be? It was a long walk back to the car—a long walk I couldn’t make any longer no matter how many pictures I stopped to take and distractions along the way. 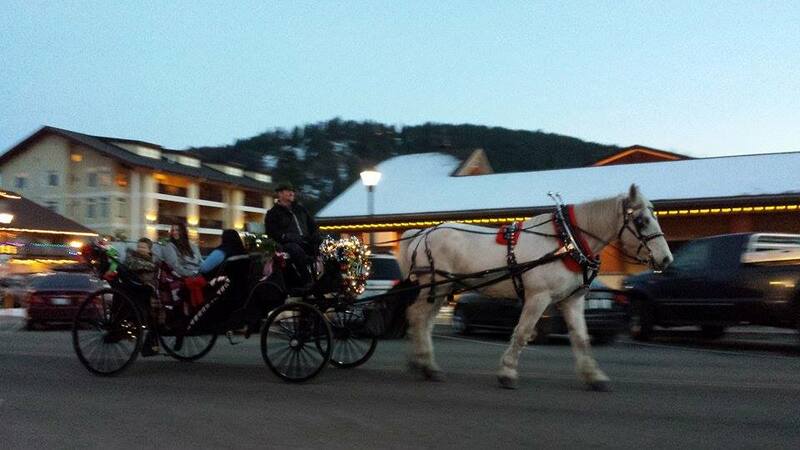 Horse-drawn carriage? Surely, we must have time for this! Alas, it seems we did not have time for it. Or we would have, only our party had not the patience. 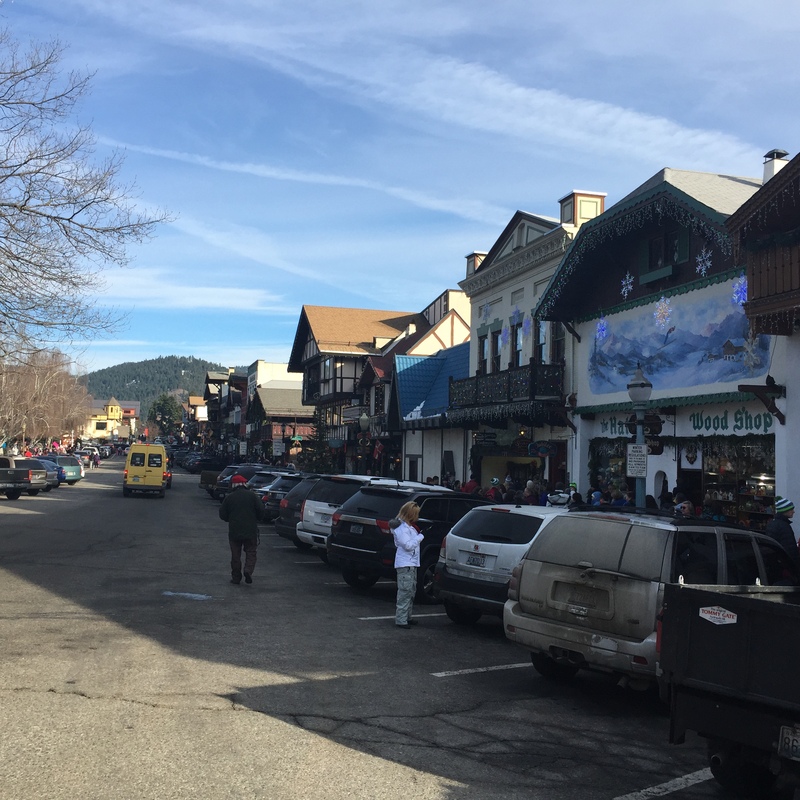 We jump in the car, and one long, complaint-filled dialogue later, we are circling around looking for parking to enjoy our whimsical town under nightfall. It’s a holiday miracle! 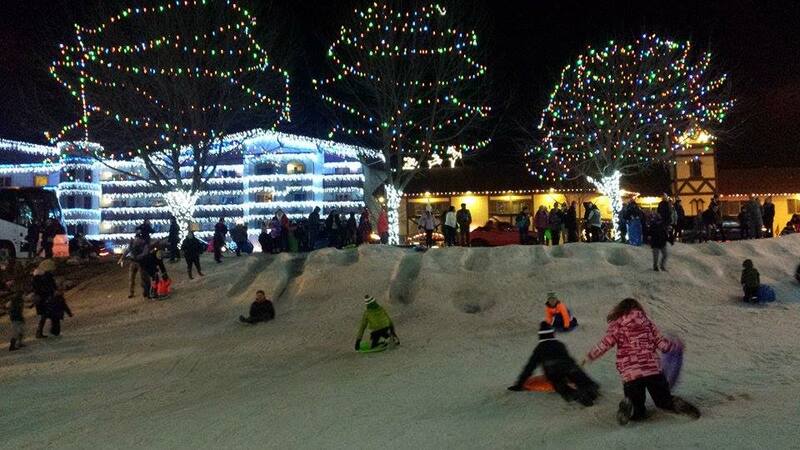 The lights were really aglow by now, with music up and down the street, hot coffee and cocoa in every hand and people nonchalantly dodging children sliding down the hill at full speed in snow saucers. I, personally, expertly dodged at least three incoming mini-humans. The cold was really setting in, though. Twilight was really the most magical time and once it was gone, and rattled by painfully convincing our party to stay longer, everything had unfortunately changed. Still lovely, but the magic had faded. So, naturally, we went for coffee to put a warm cap on a snowy day of perfection… before uploading our favorite pictures to Instagram. 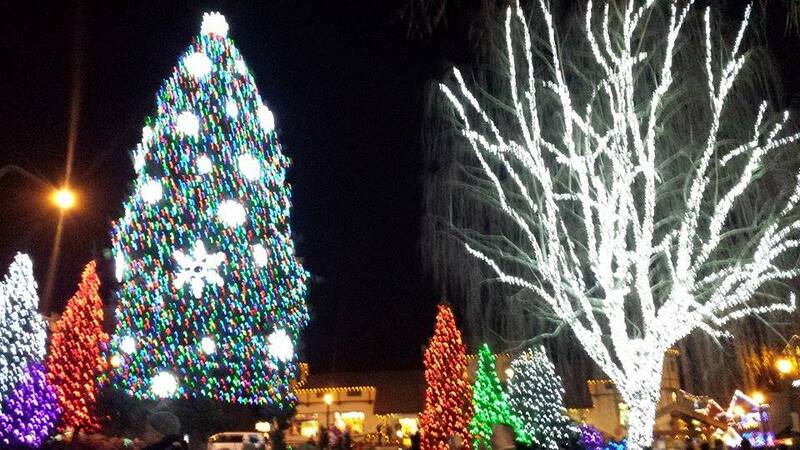 Nothing says, “it’s still Christmas!” like a blurry image of tacky tree lights. 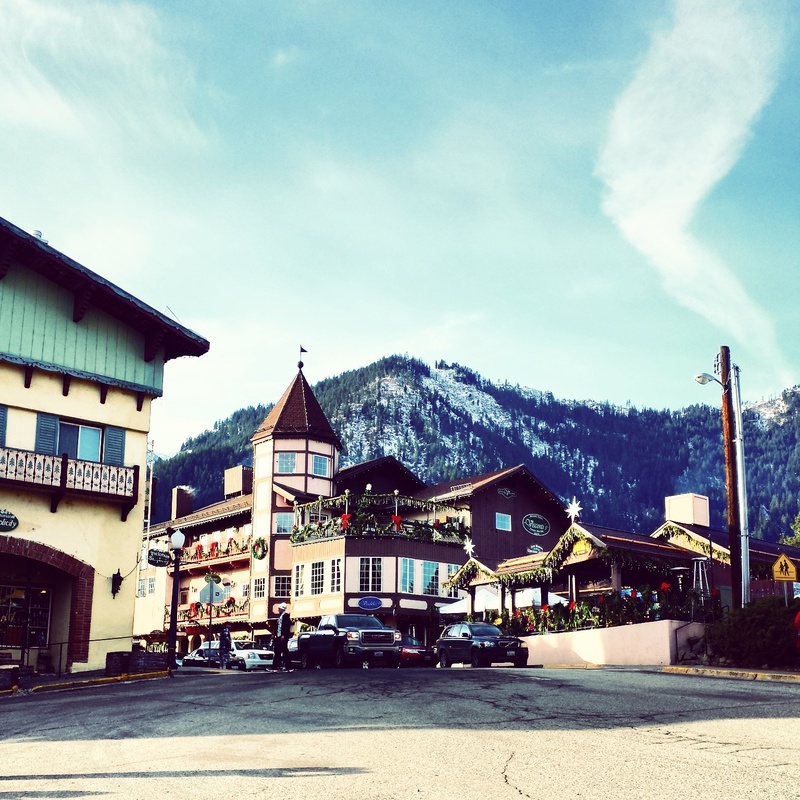 We love you, Leavenworth. Maybe next time we stop into the mechanical Christmas displays and handmade elves shop, we’ll buy something. Maybe not, but we’ll at least be interested.